Built in magnetometer GPS navigation makes GEM equipment safer. Modern Mag • Accurate, safe and reliable ground magnetic surveys. GEM systems sales. Our operators are experienced off-road drivers. Many have grown up in rural areas and enjoy the outdoor and physical aspects of the work. One of our operators walked from the Top End of Australia to Gippsland to raise funds for a prominent charity! While our operators are capable of walking large distances, an anti fatigue rest/rotation programme is implemented by ModernMag. In-house software streamlines data processing and QA/QC only takes a matter of minutes, thus allowing the field operators more evening rest. All operators have both first aid and advanced 4WD training. Our operators are standard 11 certified. They wear high-visibility field clothing. Our custom backpack contains a suite of non-magnetic safety gear. Real time tracking of the operators is available when there is mobile phone signal. EPIRBs (SPOT) are also available. GEM Systems equipment now has built in magnetometer GPS navigation with a “home safe” function that allows the operator to navigate to a predefined rendezvous point before the battery runs out. Non-magnetic PPE is available for mine site surveying. Our field vehicles carry all equipment required for safe mine site and off road operation. 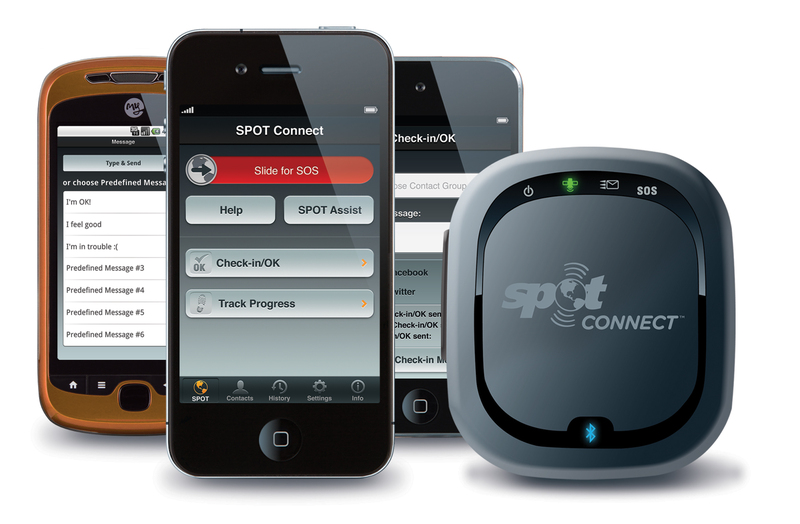 Spot connect links to a smartphone via bluetooth.